The VWR DVX-2500 Multi-tube vortexer is designed to handle your high volume mixing needs. This digital lab mixer locks multiple test tubes, vials and cylinders into place and agitates at an orbit of 3.6 mm and a speed range of between 500 and 2500 rpm. 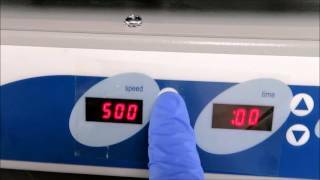 This lab vortexer can be used in either a continuous mode, or can be times up to 9999 minutes, set in 1 second increments. The perpetual magnetic motor of this multi tube lab mixer is sealed with ball bearings for smooth noiseless consistent use. The VWR DVX-2500 is microprocessor controlled and can be set from the digital control panel located right up front. This VWR DVX-2500 Multi-Tube Vortexer has been thoroughly inspected, reached it's top speeds and was tested for functionality. All of our lab equipment comes backed with our standard warranty. Should you have any questions, please don't hesitate to contact us.